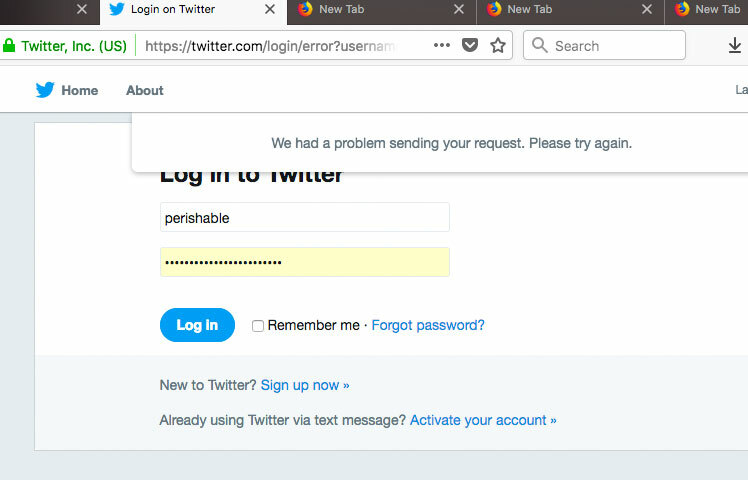 A few days ago, I was unable to log in to my Perishable Twitter account. My login credentials simply did not work. I’ve been successfully logging into Twitter since 2007 with no problems. So it was surprising at first, and then I figured it was some sort of weird Twitter bug. So I began investigating and recording the events/details in this post..
Be careful with Twitter’s Login Verification feature — it locked me out of my account for 3 days. To resolve, you need to contact Twitter support and jump through the hoops. If you don’t want to wait three (or more) days before logging into your Twitter account, leave Twitter Login Verification disabled. Instead, just choose a super strong password and enable “Password reset verification” — more than sufficient for single-user Twitter accounts. 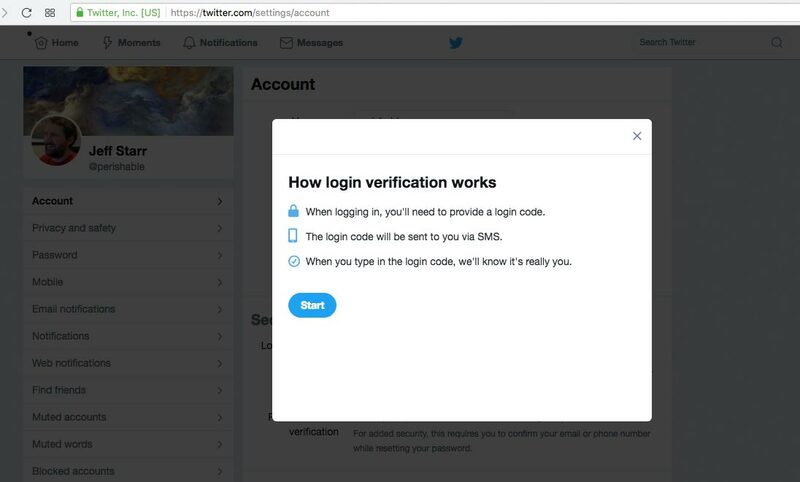 There is some sort of weird bug with Twitter’s Login Verification feature (aka text-verification, two-factor authentication, 2-factor, 2FA, et al). It’s where they send you a login code via text message that must be entered correctly before logging in to your account. This setting is disabled by default; you have to go thru a series of steps to enable it. We had a problem sending your request. Please try again. Twitter Login Fail: We had a problem sending your request. Please try again. That was around three days ago. I tried all of the troubleshooting tips, reset password, and everything else. After numerous login attempts, I grew a bit concerned. Was this a hack? A bug? Something weird like a shadowban or worse..? Obviously, it was time to investigate further.. Enter verification code. We just sent an SMS with a verification code to your phone. Enter that code below. The problem is that the text message is not sent (or received), and the verification screen is not displayed. Trying to log in just gets you that generic error message, “We had a problem sending your request.” So that was the first big clue as to what was happening. I checked my other Twitter accounts (like 7 of them) — none of which had Login Verification enabled — and was able to log in just fine. So at that point, it seemed obvious that the issue was with Login Verification, for some reason failing the login authentication process. After about an hour fiddling and testing, it was time to send a support request to Twitter. Long story short, eventually Twitter support was able to help me log in to my account. Yes it was a slow, tedious process, jumping through all of the hoops, but ultimately it worked: I was able to log in to my account once again. What was the solution? Was my “login-verification” hypothesis correct? Yes, apparently so. As shown in the following email thread, the solution provided by Twitter support was to disable the Login Verification feature. Since doing so, I’ve had no problems logging in to my Twitter account. After years of using Twitter with no problems, today I tried to log in as usual but keep getting the error: “we had a problem sending your request. please try again.” I’ve tried everything in your troubleshooting guide, reset passwords, etc., but nothing will work and I cannot log in. Please help, thank you! If you’ve tried the above options and still need help accessing your account, please reply to this email for further assistance. For security reasons, we can only process this request if you contact us from the email address associated with your Twitter account. If you need to file a new report, you can do so here: https://help.twitter.com/forms/signin. Bummer. I use email aliases for most of my online accounts. So I had to set up a new dedicated email account just for Twitter, then add the account to my email app, and then resend my initial support request. Just so that I can respond to Twitter’s email. Alright whatever, 8,500+ Twitter followers is worth the effort. So, after setting everything up, I resent my original cry for help. Hello, I have been using Twitter since 2007 and never had any issues logging in to my account. Today I tried to log in as usual but keep getting the error: “we had a problem sending your request. please try again.” I’ve tried everything in your troubleshooting guide, reset passwords, etc., but nothing will work and I cannot log in to my account. Note: I *am* able to log in to my other Twitter accounts with no problem. The only difference between the accounts is that text-verification is enabled on the account to which I am unable to log in. So I am thinking that the issue is related to that. Please help me to get logged in to my account, thank you. Open the Twitter app and navigate to “Settings”. Tap “Account”, then tap “Security”. Select “Login Requests” to see a list of all requests available to approve or deny. Pull down on the list to refresh and see the most recent requests. When you enrolled in login verification from your device, did you generate a backup code? If so, you can use that code to log in to your account on twitter.com from a desktop or laptop computer. Additionally, if you still have access to your app, you can generate a new code from your device. More information can be found here: https://help.twitter.com/managing-your-account/issues-with-login-authentication#backup-code. Navigate to your account’s “Settings”. Tap “Account”, then select “Security”. You can also check out our login verification troubleshooting article for more helpful tips: https://help.twitter.com/managing-your-account/issues-with-login-authentication. If you’ve tried the above options and still need help accessing your account, please reply to this email for further assistance. For security reasons, we can only process this request if you contact us from the email address associated with your Twitter account. If you need to file a new report, you can do so here: https://help.twitter.com/forms/signin. I have tried everything possible/recommended and still cannot log in to my account. I have been on Twitter since 2007 and never had a problem logging in. I think the issue is related to the text-verification that is enabled on my account. Because it is not enabled on my other Twitter accounts, and I am able to log into each of them just fine. Please help! I received the following reply about a day later. I thought it was going to say something like, “we have disabled Login Verification on your account so you can now log in.” But no. Apparently there was one more hoop to jump through..
We may be able to help you regain access to your account by disabling login verification. First, we’ll need to confirm you as the account owner. Please try logging in once more on https://twitter.com (from a desktop/laptop computer or a mobile web browser) with your correct username and password. This will generate a notification on our end, and we may be able to use this to confirm you as the owner of the account. Please reply to this email once you’ve done that, and we’ll do our best to help. I have done as requested and attempted to log into my account from my home computer (IP: 123.123.123). We’ve disabled login verification on your account, and you should now be able to log in without a code. Once you’re back into your account, please take a minute to double-check that your mobile settings are up to date: https://twitter.com/settings/devices. And YES! That did the trick. I immediately logged into my account successfully, checked my settings as recommended, and changed my password. All set. 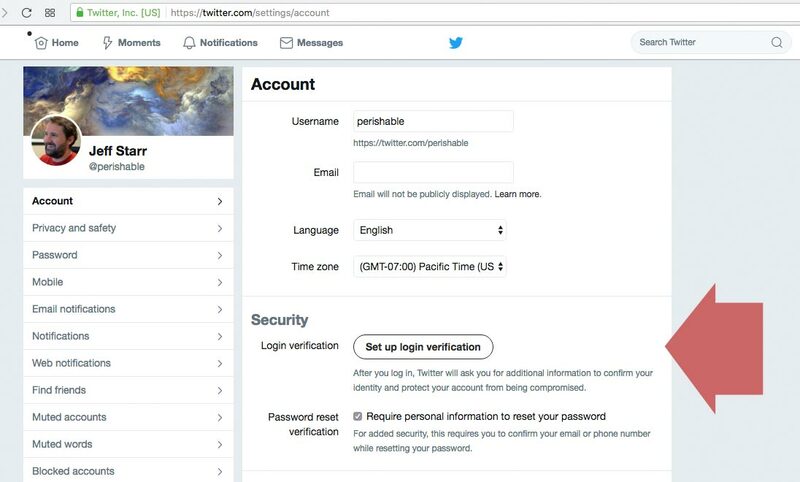 So apparently my hypothesis is correct: there is a bug with Twitter’s Login Verification feature that randomly locks people out of their account. Hopefully someone will take notice and get it resolved soon. Until then, I’m gonna go ahead and leave the two-factor login verification DISABLED from now on. LOL. Just not enough time to spend wrestling with this sort of unnecessary hoop jumping or whatever you want to call it. I think you earlier recommendation stood tall: – Use a good, strong password. I actually use a small “pen-drive” to carry my login-credentials, in text-files – because there is NO WAY I can remember those passwords. – LOL! I also found that using WordPress.org’s – on-line WP-Salt generator as a good source of strong passwords. Ultimately, it is WE who can provide the best form of security, “physical security” (IE: Keeping our passwords physically safe). 2FA is a great idea, . . . When it is working properly!